Park In-bee and Park Sung-hyun’s animal love. March. 22, 2019 08:15. by Jong-Seok Kim kjs0123@donga.com. Korean LPGA players Park In-bee and Park Sung-hyun have something in common because of special bond with their pet dogs. 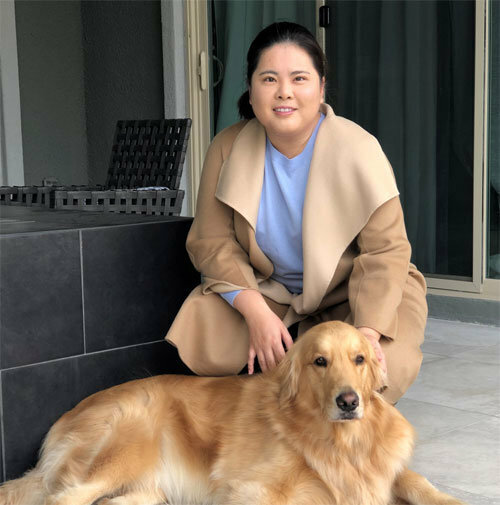 Park In-bee is living with a golden retriever called “Rio,” whose weight is nearly 40 kilograms, at her home in Las Vegas, the U.S. Rio was a present from her husband and swing coach Nam Gi-hyup immediately after winning the gold medal at the 2016 Rio de Janeiro Olympics. She loves her dog so much that she took Rio with her when she moved to the U.S. last year. Meanwhile, Park Sung-hyun has two dogs called “Daon,” a Labrador Retriever, and “Ato,” a Rottweiler, at her home in Gimpo, Gyeonggi Province. Each of her two pet dogs weighs over 30 kilograms. She met Ato in the U.S. but had to send Ato to Korea to have her mother and sister take care of the dog as she spent most of her time away from him. The name “Daon” means “all the good things are coming” and “making all on green.” “Ato” is a pure Korean word that means present. Two weeks after adopting Ato in the U.S. in 2017 when she was going through a slump, she won the at the 2017 U.S. Women's Open.